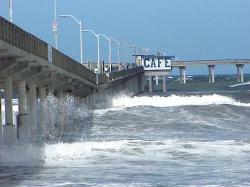 The Ocean Beach Municipal Pier is located at the south end of the beach and is available to the public for walking and fishing. There is a restaurant and bait shop on the pier. Fishing from the pier does not require a fishing license, but catch regulations are enforced. 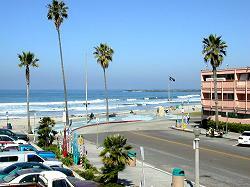 Numerous restaurants, surf shops, and other commercial establishments are available near the south end of the beach. The north end of the beach is primarily bordered by residential properties. 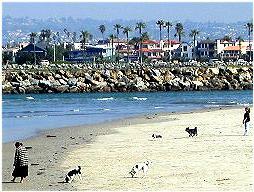 One unique feature of Ocean Beach is Dog Beach, a sandy area at the north end. This is a dog run area where dogs are permitted without a leash at all hours of the day. Dog owners are responsible for control and clean-up of their dogs. Standard dog laws apply on other portions of Ocean Beach and are strictly enforced. Lifeguards are staffed daily, year round at the main lifeguard station at 1950 Abbott Street. In summer, additional lifeguards are staffed along the beach in seasonal lifeguard towers. Lifeguards are generally on duty from 9:00 a.m. to dusk; but check with lifeguards for specific staff hours. Most California beaches experience strong rip currents. Ocean Beach experiences particularly strong rip currents which necessitate over 1,000 water rescues by lifeguards each year. Our safety tips section provides an explanation of rip currents and some methods of freeing yourself if caught in a rip current. The best advice is to swim near a lifeguard. Surfing is permitted at this beach in designated areas. This beach is not recommended for scuba diving due to lack of undersea life, heavy water activity, and surf. Public restrooms with showers are located adjacent to the main lifeguard station at 1950 Abbott Street and adjacent to the parking lot on the north end of the beach at the west end of Brighton Avenue. There is wheelchair access along the walkways at the south end of the beach and on the Ocean Beach Pier. A temporary rubber walkway is often available beside the main lifeguard station at 1950 Abbott Street to allow limited access over the sand. A special beach wheel chair, which requires an attendant, is generally kept at the main lifeguard station and available on a first come, first served basis at no charge. Containers for beach fires are generally provided during summer months and available on a first come, first served basis. The burning of rubbish is prohibited. Only wood, charcoal, or paper products may be used as fuel. Fuel for the fire may not exceed a height of more than twelve inches above the upper edge of the fire container. The fire must be extinguished before leaving the beach. Open beach fires outside containers are prohibited at all San Diego beaches. Dogs are permitted on the north end of the beach (Dog Beach) at all hours without a leash. Owners are responsible for control and clean-up of their pets. Consumption of alcohol is permitted on the beach from 12:00 noon to 8:00 p.m., but prohibited at all times in parking lots, adjacent walkways, and grassy parks adjacent to the beach. Take Interstate 8 westbound to the end, then take a left on Sunset Cliffs Boulevard. Take a right at the signalized intersection of Santa Monica Avenue and follow it to the beach. There are 298 public parking spaces (including three disabled spaces) in the public lot at the foot of Voltaire Street. This lot is adjacent to the north end of the beach and Dog Beach. There are 68 public parking spaces (including two disabled spaces) at the foot of Santa Monica Avenue adjacent to the main lifeguard station. 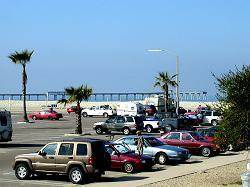 There are 110 public parking spaces (including three disabled spaces) at the foot of Newport Avenue, adjacent to the Ocean Beach Pier. The basic rule of thumb is that any gathering of over 75 people requires a permit from the Park and Recreation Department. A permit is also required for a wedding, water event, athletic event, voice and/or music amplification, or use of special setup equipment (such as an inflatable party jump, dunk tank, canopy, etc.) For permit information call Regional Parks at (619) 235-1169.